Even wanted to share your best pizza moments, topping preferences, recipes or the like? Well, here's a thread dedicated to pizza. Okay how do people feel about pineapple pizza? This always creates discussion whenever I ask. I personally hate pineapple pizza. It's wrong and evil. My fave pizza is the veggie volcano from dominos. Soooo good. Curry sause, chicken, pepper, pepperone and cheese. Maybe not the best pizza I have ever eaten, but still sooo good! Okay how do people feel about pineapple pizza? I like most pizzas, unless they have really spicy toppings or sauce. Cool, I've never had a pizza nemesis before. I think it involves eating lots of pizza and feeling superior about your topping choices. I'm fine with or without it. Totally depends of the day, my current mood and positions of the planets. Sometimes I want something super salty and go with kebab, bacon and stuff like that. Some days I want something.... hmm... more "fresh" and then I might want some pineapple into it. I used to eat pineapple basically on every pizza earlier, but nowadays not that much, because I have found so many other optional toppings too. However, it's still completely valid option. Totally depends of the day, my current mood and positions of the planets. Not quite sure what you did there to trick me away from the pineapples... Anyhoo, answer was easy... potatoes! I have never tried potato pizza, but that's definitely one of the things that I have to try! People keep saying it's really good. Curse you guys, I'm hungry now. My favorite pizza came from a little place in San Diego; Pizza Bella out in Old Town. There wasn't anything really fancy about it, it was simply well-made pizza. Sure, they have "The Kitchen Pizza" (mixed sauce (red and pesto), chopped pepperoni, Italian sausage, red onion, green deli olives, jalapeños, ricotta and feta cheeses, fresh basil & pineapple ) if you have the urge to get a little weird (who in their right puts jalapeno and pineapple together?) , but it was one of the only places I've been where even a simple cheese pizza there was awesome. 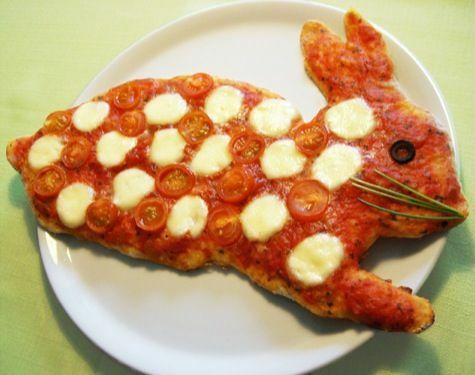 How about a nice, cute pizza to help with that (your post is hours old by now, but it's never too late for pizza!)? Cyberpunk has you... Follow the pizza rabbit... Knock, knock. A classic Margherita is one of my favourites. Pizza can be found in all corners of the world forum.